As folk biographies go, they don’t get more picturesque than that of Van William Pierszalowski - a California singer-songwriter who spent his childhood summers on his father’s commercial salmon trawler in Alaska and later moved to Norway. 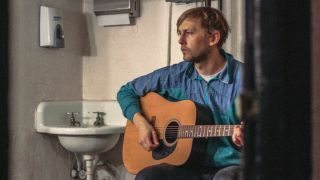 Audiences may know him already from previous bands Waters and Port O’Brien, and more currently, Revolution, a collaboration with Sweden’s First Aid Kit, with whom he's currently touring North America. We spoke to him about his debut full-length solo album, Countries, which is out now. How would you describe your style to people who haven't heard it before? "I usually say something along the lines of indie-folk-rock songs with pop structures, while making a face that says, 'I am so uncomfortable trying to describe this right now.' If a record store had a 'recommended if you like' thing, I would hope that it read early '70s Neil Young, Beck’s Sea Change, with a little Nirvana Unplugged." "I have never been close to as happy as I am with Countries. It was truly a labor of love. I spent years working on the songs. I’m not a very fast writer, so I had to bunker down for long stretches of time at my folks’ little cabin in the Sequoia National Forest to hone in on all the little details. In terms of what you can expect, I’d say tightly arranged, mostly acoustic-driven folk rock songs with pop sensibilities drenched in sweat and weed. And strings." How did the First Aid Kit single come about? "I first met Klara and Johanna from First Aid Kit years ago. Their first tour ever was opening up for my old band Port O’Brien throughout Europe in the late 2000s. We fell out of touch for many years, and then rediscovered each other at a mutual friend’s house party in LA a couple years ago. "I sent them the record I had been working on, and they expressed interest in singing on Revolution and making it a proper collaboration, which we did in a matter of days. I had to pinch myself I was so excited about how it was all sounding." "Let’s get the bad stuff out of the way. For one, the drives can be insanity-inducing. By far the hardest part is being away from my partner and my dog. But when I was making the record, I had no idea I would get to tour at all, so I’m definitely not taking that for granted." How did you first get into playing the guitar? "I got my first guitar when I was in 4th grade. I was obsessed with Green Day’s record Dookie, and I wanted to learn how to play exactly like Billy Joe [Armstrong]. My parents didn’t want me to start on electric guitar, so they got me this small nylon-stringed acoustic. I still own it. "At first, I was jealous of my friend’s guitar, because it was proper-sized and had a rad old McGovern sticker on it, but I grew to fall in love with that first guitar. Throughout high school, I would play it every chance I could get. Currently, it’s acting as my beach guitar." "Before I discovered Green Day, which led me to the Ramones, Subhumans, and other punk bands, I was into the Beach Boys and The Beatles. Those were the first melodies bouncing around my head, and I’m so grateful for that. In high school, I grew to re-appreciate The Beatles and the first two John Lennon solo records. "I also got into indie rock, particularly early Modest Mouse, Built To Spill, Pavement, Belle & Sebastian. Nirvana is my favourite band of all-time. And Neil Young. Did I mention Neil Young yet? "I still listen to a lot of the same stuff, and my friends’ music. There’s something so interesting to me about hearing what your homies are up to. In that category, I’ve been spinning Fruit Bats, Jim James, Dawes, Springtime Carnviore, Kevin Morby, and First Aid Kit. I’ve also been obsessed with this other Swedish band The Radio Dept. for the last few years." How did you get into playing professionally? "My first serious band Port O’Brien caught a few lucky breaks while I was in college at Berkeley. By some stretch of luck, one of my favourite songwriters M Ward happened to be at a show of ours in San Francisco and loved it. "He gave an interview with Pitchfork, which mentioned us a few times, and sent the tunes to Conor Oberst, and before you knew it, we were on tour with Bright Eyes and had a management team, booking agent, lawyer, and label interest. It was the most exciting time in my life. I still have the same incredible manager." Tell me about your setup for the live shows. "On the First Aid Kit tour, we're a three-piece. Kera plays bass and sings, and Brian Andrew Marquez plays drums. For local shows and TV appearances, Greta Morgan from Springtime Carnivore plays keys and sings." What gear are you using onstage? "For my acoustic, I had been using a Fender CD-320AS Dreadnought, which I loved, until I tripped over a cable and busted it. I bought this old beat-up Rogue acoustic in Seattle at American Music, and it’s a dream! It’s basically a beater, but gets the job done very well. "On electric, my main guitar is a custom built by Reuben Cox at Old Style Guitars in LA. It’s so gorgeous and plays incredibly well. It was actually stolen from our trailer after a tour in San Francisco, only to be found by Reuben (who made the freaking guitar!) at a swap meet in Pasadena over a year later. "We’ve been doing a cover of Neil Young’s Cinnamon Girl, and for that I use my Fender Telecaster AA with his standard double drop-D tuning. I use a Fender Deluxe Reverb amp for both acoustic and electric. I blend the DI and amp for the acoustic, using an old Boss Blues Driver on it. "For my electric, I have a very simple pedal setup, with the Fulltone Full-Drive 2 Mosfet always on, using the boost on it with the Blues Driver for lead stuff. I also have a Holy Grail in there for some extra reverb-y moments (I have the reverb on the amp always on 2 or 2.5)." 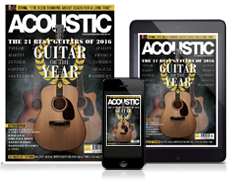 Any notable acoustic guitars in your personal collection? "My main baby is a 1987 Guild D-25. I bought it from Old Style a few years ago, and I wrote and recorded most of Countries with that beauty." "It almost always starts on acoustic guitar. I usually have little bursts of creativity that result in some vague idea of a riff or chord structure or melody. Then, I start building a track in Logic, beginning with the drum idea. I have a pretty deep collection of drum samples, so if I start there it starts to take shape pretty quickly after that. "I usually build out the structure before I tackle the lyrics, which are the hardest part for me. I also have a small circle of friends in LA that I feel comfortable working with." "The release of this record, Countries, was the proudest moment of my career. I’ve just never had a record that I still love this much after it’s been released. In terms of other highlights, smoking a joint with Neil Young and then learning he loved my band was a pretty tough one to beat. Playing on Conan and meeting Ringo Starr is also definitely up there." "If I could do it all over again, I would have kept taking lessons. I plateaued for a long time in my playing abilities. Lessons give you more little tricks to put in your bag."